"How do we become who we are in the world? We ask the world to teach us. "On her 120-acre homestead high in the Colorado Rockies, beloved writer Pam Houston learns what it means to care for a piece of land and the creatures on it. Elk calves and bluebirds mark the changing seasons, winter temperatures drop to 35 below, and lightning sparks a 110,000-acre wildfire, threatening her century-old barn and all its inhabitants. Through her travels from the Gulf of Mexico to Alaska, she explores what ties her to the earth, the ranch most of all. Alongside her devoted Irish wolfhounds and a spirited troupe of horses, donkeys, and Icelandic sheep, the ranch becomes Houston’s sanctuary, a place where she discovers how the natural world has mothered and healed her after a childhood of horrific parental abuse and neglect. In essays as lucid and invigorating as mountain air, Deep Creek delivers Houston’s most profound meditations yet on how "to live simultaneously inside the wonder and the grief…to love the damaged world and do what I can to help it thrive." It's ostensibly the story of the lifesaving properties of [Pam Houston's] high-elevation ranch in Colorado, although there's not much to cultivate up there in the long winters except, apparently, self-delusion and acres of self-satisfied contradictions.... The social and environmental injustices that reduce Houston to tears are no accident; they're a fairly widespread global arrangement in which many of us are wittingly or unwittingly complicit.... She might have told us what she herself was doing to combat this climate change she so laments. That would have been the beginning of a decent, possibly instructive memoir, or at least something beyond these sleepy musings. [Houston's] beautifully composed paean to wilderness living combines tales from her conflicted childhood with homestead journaling, descriptions of favorite animals, travels out to exotic places, and simple, homey happenings. After she took another large risk, investing in the restoration of the tiny Pinckley cabin, Houston found in it a place to rest and write, and concludes, It's easy to believe I have done the right thing, on behalf of Pinckley's ghost and on behalf of my writing. Her readers will doubtless agree. One of the memoir's most engrossing sections describes 2013's huge West Fork fire. Ignited by lightning, it would join the Windy Pass fire and Papoose fire, threatening the ranch as it burned more than 109,000 acres. Houston's dramatic account of this includes terms she learned about fire behavior and firefighting methods, helping readers appreciate the immense threat in times of drought. 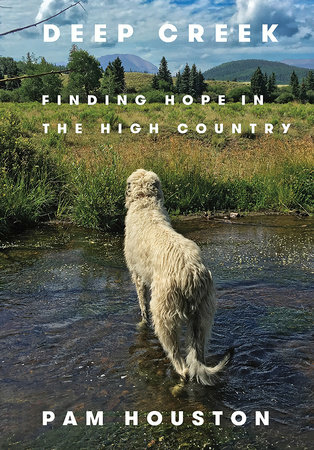 ...[a] beautiful and inspiring new book about writing and life in the American West.... Houston, as generous a teacher and friend as she surely must be, seems particularly attuned to animals.... [G]ood writing can make you envious, no matter how foreign the terrain. Other times, you read a good memoir and find yourself wanting to track down the author and become friends. A third kind of book is so insightful and evocative, you shelve it beside other favorite and instructive titles. Deep Creek might just do all three. Deep Creek is an honest-to-goodness memoir. So it's funny that some of her true stories seem unbelievable... Houston here lets truth tell the stories she wants to tell, and they are quietly stunning, but also provocative in the contradictions she poses.... Houston's goal is to try and live simultaneously inside the wonder and the grief of life's moments, whether they are forest fires or violent fathers, without having to diminish one to accommodate the other. This is not the casual stuff of New Year's resolutions. But the goal's complexity may be Houston's intent, pushing us to pause and think and ponder and wrestle and, ideally, to do something. But above all, to hope.